An old commie hunter, Uncle Boonmee is haunted by spirits. However, his ghosts are largely benevolent, seeking to comfort Boonmee during his final days. 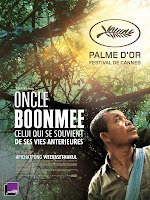 Rife with magical realism but deliberately toying with narrative structure, Apichatpong Weerasethakul’s Cannes Palme D’Or winning Uncle Boonmee Who can Recall Past Lives (trailer here), screens this weekend at the 48th New York Film Festival. It has been an eventful life, but it is nothing compared to Boonmee’s visions of his previous incarnations, particularly an episode in which a mystical catfish ravishes a self-esteem-challenged princess. 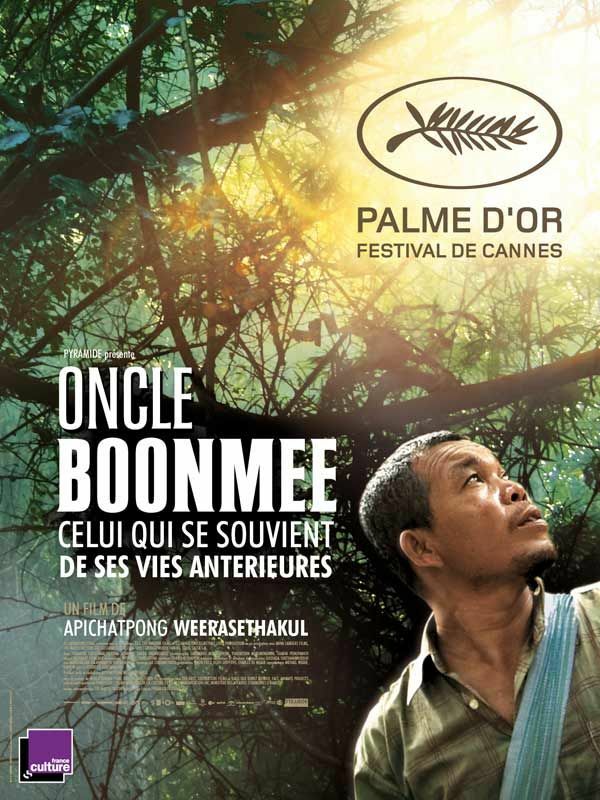 Consistently obscure throughout Recall, Weerasethakul never explicitly spells out Boonmee role in this Leda-like tale, but since the lagoon is described as the place where Boonmee’s lives began, it seems safe to assume there is some fishy DNA in his karma. Though Boonmee ruefully suggests his current bad karma stems from his past anti-Communist military activities, perhaps he should ask the Cambodians about what he helped spare his countrymen (“you did it for your country,” his sister-in-law Jen reminds him). Regardless, Weerasethakul’s somewhat veiled commentary is so deeply buried under multiple layers of symbolic meanings and narrative gamesmanship, it is doubtful Recall will inspire many viewers to spontaneously erupt in a rendition of “The Internationale.” Instead, those so inclined will probably break the film down into the parts they can deal with, whether they be the animatronic catfish or Buddhist reincarnation themes. Of course, there is something problematic about a film’s whole if it is less than its constituent parts. Between its double-secret allegories, nonlinear forms, and deliberate stylistic shifts, Recall is so busy displaying a self-conscious artiness, the rain forest gets lost for the trees. In fact, Recall along with the experimental companion short Letter to Uncle Boonmee were conceived as part of Weerasethakul’s multi-media, multi-platform project Primitive. There are indeed times when the static quality of Recall and particularly the narrative-free Letter seem more closely akin to installation videos than stand-alone films. Though the late reappearance of characters from Weerasethakul’s past films might be enriching for those in the know, bringing things full circle, in practice it is a limiting strategy. Yet , Thanapat Saisaymar still manages to express something fundamentally human as the dying Boonmee, while Jenjira Pongpas also adds a bit of grace to the proceedings as Jen. Obviously, Recall is a film for festival audiences, but its Cannes laurels have earned theatrical distribution via Strand Releasing. It will be a tough sell. Recall boasts some fine performances, but it thoroughly blurs the line between avant-garde provocation and pretentiousness. A likely sell-out anyway, it screens this coming Saturday (9/25) and Sunday (9/26) at Alice Tully Hall as part of the 2010 NYFF.